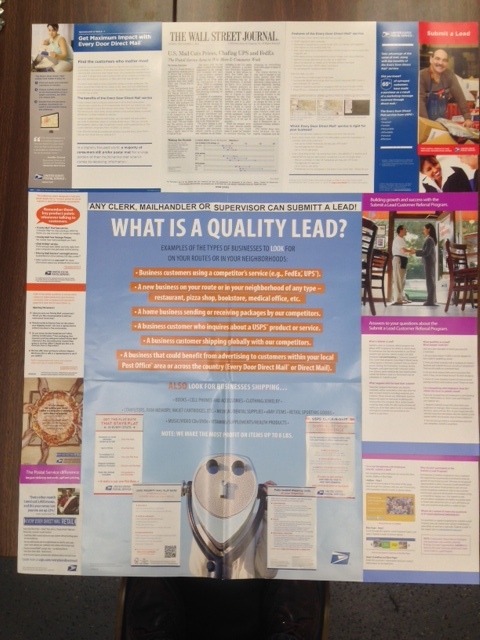 Our QWL has stepped up another notch in getting the word out to all employees about all the benefits in our Mail Handler Submit a Lead program. On display against the wall in our employee entrance lobby is a poster chart we grouped together with all the valuable information provided us. Included is a display table with informational submit a lead handouts, benefits of every door direct mail service and the latest employee service talks for all employees to see when they enter and exit the work room floor.